There’ve been some exciting developments in and around those two hotly contested islands in the South China Sea (the Senkaku Islands). It went something like this: last Saturday, China announced that any aircraft flying their newly designated Air Defence Identification Zone (ADIZ) above the islands, claimed by both Japan & China, must file flight plans and identify themselves to Chinese flight control, or face “defensive emergency measures”. The US replied on Tuesday by flying two B-52 bombers through the ADIZ, without China’s permission.. This defiant response created a lot of tension. Then on Thursday, Japan and South Korea followed suit, flying aircrafts of their own over the islands. China scrambled fighters to monitor the 2 US aircraft and 10 Japanese planes in the ADIZ – leading to a very dicey situation in the skies. Shinzo Abe said on Friday that Japan would respond “firmly but in a calm manner” to China’s move. On Friday, however, the US backed down a litle bit – a senior official in Obama’s administration said that commercial airlines are being told to abide by the new rules and call Beijing to notify it of plans to traverse ADIZ, even if the US Government doesn’t recognize it – they’re concerned about the civilians. A number of regional commercial airlines have also said that they will comply with China’s new needs – nobody wants airliners being shot down because of this geopolitical mess. The reason for all this is the long history of rivalry between China and Japan (and China’s painful memories of being invaded by Japan in WWII), and of course China’s recent policy of expansion. Now that China is the second largest economy in the world (and soon to be the biggest), it wants it’s dominance in the region to be established fully. 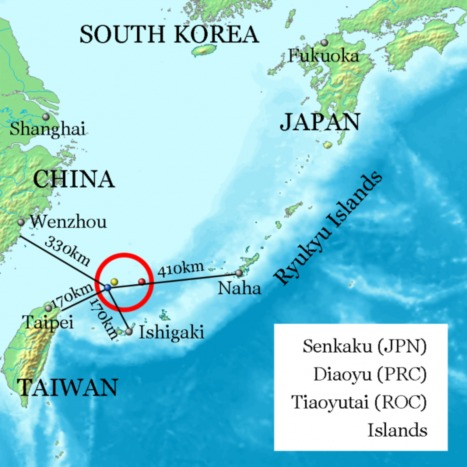 The current tension stems from a small group of islands (which are nearest to China geographically) called the Senkaku Islands, but which have been controlled by Japan since the last century. China has now taken over (can we say “conquered”) the air space above these islands by declaring it an Air Defence Zone where all aircraft passing through it have to identify themselves to Chinese authorities and take permission to fly through. Everyone including the USA, Japan and South Korea have protested and there is the Top Gun style grandstanding with fighter planes being scrambled from all sides and flying around in the same area – a very risky situation. If someone gets shot down, there will be a real geopolitical crisis! Keep watching.